A British police officer on Thursday guards a cordon which was extended overnight to include the Lush House car park adjacent to the Queen Elizabeth Gardens park in Salisbury, England. 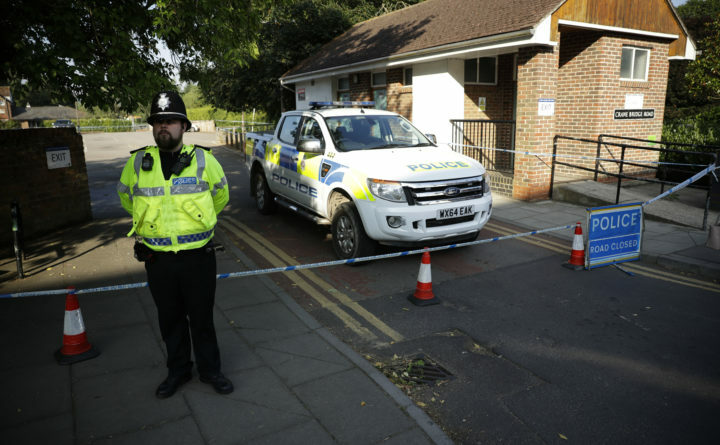 British officials ware seeking clues Thursday in the rush to understand how two Britons were exposed to the military-grade nerve agent Novichok. The new case has surfaced at a sensitive time as England’s soccer team is advancing in the World Cup, a global competition staged this year in Russia. It also comes days before a NATO summit expected to focus in part on worsening relations between Russia and the West. Home Secretary Sajid Javid is chairing a meeting of the British government’s COBRA emergency committee on Thursday morning. He will brief the House of Commons on the matter afterward. Local police declared the case a “major incident” Wednesday, four days after the couple — identified by friends as 44-year-old Dawn Sturgess and 45-year-old Charlie Rowley — were found collapsed at a residential building in Amesbury, eight miles from Salisbury, where the Skripals were poisoned. Britain’s senior counter-terrorism police official Neil Basu said police do not know whether the nerve agent came from the same batch that left the Skripals fighting for their lives. “The possibility that these two investigations might be linked is clearly a line of inquiry for us,” he said late Wednesday night. The Skripals’ illness initially baffled doctors after they were found unconscious on a park bench in Salisbury. Scientists at the Porton Down defense laboratory concluded they had been poisoned with Novichok, a type of nerve agent developed by the Soviet Union during the Cold War. It was believed to have been on the front door of Sergei Skripal’s home. After spending weeks in critical condition, the Skripals slowly got better and were released from the hospital and taken to an undisclosed location for their protection. Doctors say they don’t know the long-term prognosis. Associated Press writers Danica Kirka and Jill Lawless contributed to this report.